With earnings season in full swing, we thought it helpful to outline what we are looking for in oil and gas production and refining company statements and earnings calls. Several key topics will dominate oil markets next year, and how companies are thinking about those topics now will likely play a large part in determining their strategic success next year. Next year is likely to see the trend of rising costs continue to impact US producers small and large. 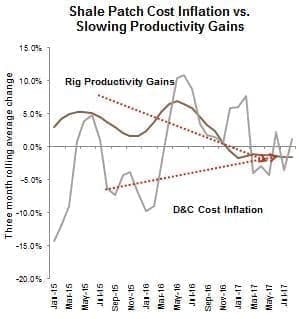 Since the start of 2017, D&C costs have risen and productivity gains have fallen. Productivity is falling because producers are expanding outside of their core acreage, drilling in slightly less prolific areas. We would expect that as drilling programs continue to expand, productivity gains will continue to suffer since producers will be forced into their less productive acreage. In order to compensate for lower quality acreage, producers will be forced to increase overall activity levels bringing on more rigs to drill a higher number of wells. This increased activity will feed back into the rising service costs story. Service costs will continue to rise on both increased activity from producers and logistical bottlenecks. After the oil price crash in mid-2014, service companies ratcheted down activity and were more willing to negotiate on contracts and pricing. Now that prices are slowly improving and drilling programs are expanding, we would logically expect the laws of supply and demand to kick in and for service companies to increase their rates to more profitable levels. Additionally, many service companies are running into logistical bottlenecks, particularly around hiring back enough labor to support current activity levels. After a significant portion of the oil and gas workforce was laid off as part of cost cutting efforts, many people have moved to more stable industries. Wages will have to again rise high enough to entire enough qualified workers to return. For service companies, we are looking for evidence that they are working to raise competitively renegotiate contracts and raise rates. We are also interested in any commentary around efforts to solve the logistical bottlenecks. When it comes to E&P companies, we are looking primarily for acknowledgement of the serious risk posed by rising costs, and for any indications of a plan to deal with rising costs, beyond the usual “negotiate competitively” lip service. 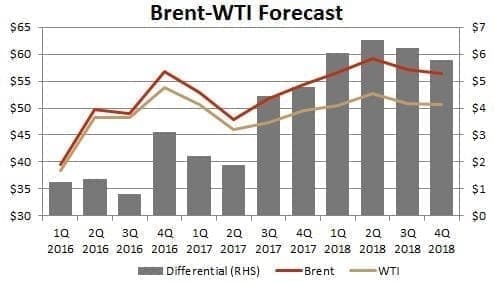 Stratas Advisors currently expects Brent to continue outpacing WTI through at least the first half of next year. Brent will be supported by balances tightening faster than in the US as OPEC’s supply deal holds steady. The wide differential will likely drive additional U.S. crude exports. While we do not expect the differential to remain economic forever those companies with the ability to export will have a temporary leg-up on the competition. Additionally, higher U.S. crude exports combined with elevated runs will help draw down U.S. stocks faster than runs alone. This means that the wide differential will disappear quicker than in a no-export environment, shortening the time-frame refiners have to take advantage of higher margins. We would expect to see those companies that can export their crude easily touting the additional market access, while we would hope to see refiners talking about diversity of sourcing, both domestically and abroad. The oil majors will likely have considerable success in exporting their US production given expansive trading operations already in place. As balances slowly tighten, we would expect markets to react more strongly to outages, whether caused by weather or geopolitical issues. Refiners in Europe are particularly at risk next year given their generally lower profitability to begin with. While it is impossible to fully predict, wildfires in Canada, hurricanes in the Gulf Coast, tornadoes in the Mid-Continent are always a potential risk to crude oil production. Severe winter weather is also a risk on the product demand side in and out of the United States. Outside of potential weather impacts, we are especially cognizant of potential geopolitical disruptions. 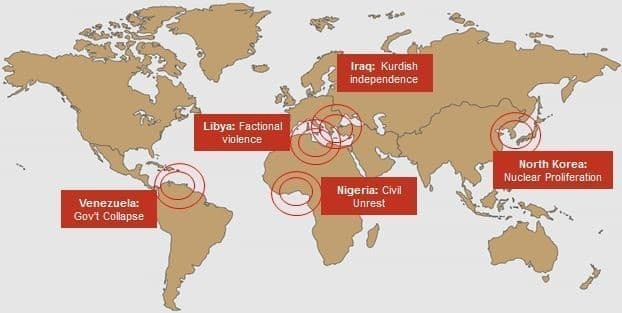 Geopolitical hotspots we are watching for next year include Venezuela, Iran, Iraq, Libya and Nigeria. Given the slow-burn occurring in Venezuela and already sharply reduced exports, a collapse would likely have the largest impact on China and US Gulf Coast refiners. In the U.S. even the impact would be relatively minimal as refiners have been steadily cutting deliveries from Venezuela due to payment and quality problems. More substantially, Chinese refiners would then be missing out on volumes promised under various cash-for-oil loan schemes. Chinese refiners would be forced to replace those volumes in the spot market, potentially raising heavy crude prices. If volumes in Iran were to go offline due to sanctions (an admittedly unlikely outcome) this would have a large negative impact on European refiners. The typical replacement for Iranian volumes are Urals or Iraqi grades. However, if fighting persists in northern Iraq, those volumes might not be able to answer the call. Additionally, due to recent tax reforms in Russia, many companies now find it more profitable to refine the crude and export the product. While large-scale outages obviously affect all players in the oil and gas sector, for the purposes of this exercise we are primarily interested in impacts to refining, given our expectations for healthy global margins and elevated runs next year. Persistent outages caused by geopolitical upset could also cause oil majors to reconsider investments in those regions, driving more dollars to relatively safer countries like the US, Canada, Mexico and the North Sea. We would hope to see refiners across the board talking about diversity of supply, whether they’ve been testing other crudes just in case they need to use them, and what plans they have in case there is an outage to their main supplier. With the OPEC deal in place through the end of the year (a Stratas Advisors forecast) the heavy light crude differential will likely remain narrow, and could be pushed even tighter by outages. 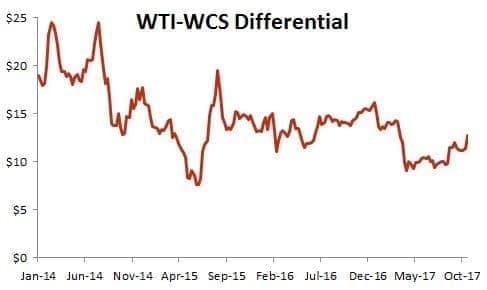 We’ve seen the differential narrow significantly already this year as the deal came into effect and removed heavy crude from the market. Higher prices for heavier crude will actually squeeze margins at the most advanced refineries, which are designed specifically to run heavier, lower quality crudes and thus invested heavily in upgrading equipment. There is potential for a disconnect with older, less advanced refineries actually outperforming their more advanced competition. We are looking for refineries to talk about their diversity of supply and also their ability to shift slate and yield in response to relevant market conditions. For companies that predominantly have some of these simpler facilities, we would hope to see how they plan to balance maintenance with keeping runs high in order to take advantage of margins for as long as they last.